It is because of DOUG ALLEN NASH'S great performances and charisma that he received the United States Department of Defense's Certificate of Esteem Award, Certificate of Appreciation Award, Republic of Korea's Apple of Excellence Award, and inducted into the South Dakota Country Music Hall of Fame. 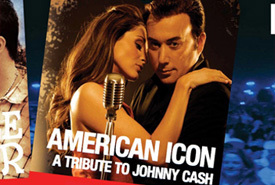 Doug Allen Nash is currently performing "Johnny Cash Tribute - American Icon". It is in this production, Nash debuts one of his own songs "June" co- written and co-produced with Jeff Silverman in Nashville, TN. Engineering mix by Grammy Award winners John Carter Cash and Chuck Turner at Cash Cabin Studio in Hendersonville, TN. Doug Allen Nash has performed internationally in over 85 countries while touring for USO, MWR, and Armed Forces Entertainment. He was a featured artist on the Armed Forces Network commercial in Europe, appeared on radio and television interviews as well as radio play on European Music Charts. Nash has also performed nationally from the Las Vegas strip to major casinos and resorts such as Sun Valley, Idaho, Opryland Hotel, and Taj Mahal in Atlantic City. He has been the opening act for Wayne Newton, Charlie Daniels, Huey Lewis and the News, The Oak Ridge Boys, Montgomery Gentry and other national recording artists as well as being the house band for the largest grossing venue in Texas, City Streets. Nash co-produced the trademark show 'Almost Angels', a long-running production in Atlantic City. Doug Allen Nash was raised on a farm in rural Northwest Illinois just 2 1/2 miles from the Mississippi River. He began his journey as an entertainer at just five years old by performing at talent shows, school functions, and social events. He had formed his own band by the time he was 12. At age 20, Nash began performing around the globe. It was during this time Nash met other great entertainers including the legendary Johnny Cash.